California fires really are the new norm as five of the most destructive fires in the state's history happened in 2017 and a further 7 countries recorded their largest wildfires during this year. New Delhi, home of more than 20 million people has become a gas chamber according to their mayor as levels of PM2.5 that enters deep into the lungs and bloodstream, reached 703 double the mark of 300 that authorities deem as hazardous causing the city to choke because of fires in 2017. Five of 20 most destructive fires in recorded history ravaged the state in 2017, according to Cal Fire. The incredible statistic shares insight into our fragile echo system as Chile, New Zealand, Portugal, Italy, Spain, Italy and Canada recorded their largest-ever wildfires in 2017. The disastrous fires in Italy this autumn had the government claiming the wildfires are a new form of terrorism. 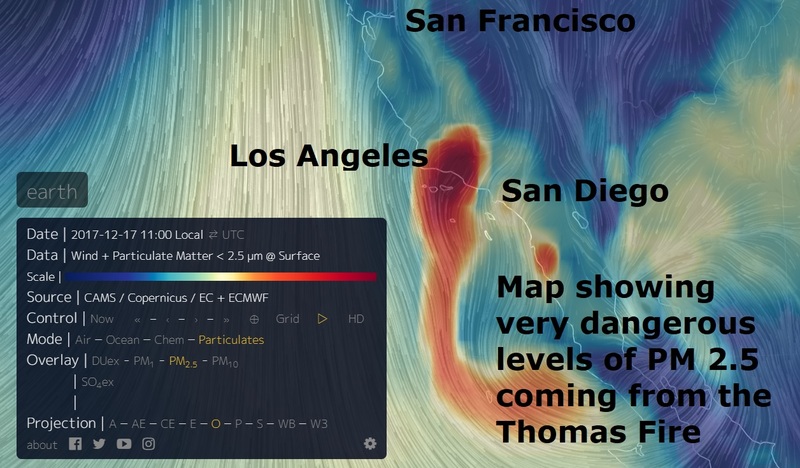 The Californian Thomas wildfire is on the rampage again as strong winds which act like rocket fuel is fanning the flames to a staggering 267, 500 acres, just 32, 500 short of the all-time record for California. Almost 10,000 brave firefighters are now tackling the monster wildfire which began incredibly two weeks ago and is not slowing down anytime soon. More than 1,000 homes have now been destroyed with a further 20,000 in danger. Winds of up to 55 mph are forecast today in the fire-ravaged area which makes the fire almost invincible. According to Reuters the blaze, centred less than 100 miles (160 km) northwest of downtown Los Angeles, has forced evacuations that turned neighbourhoods into ghost towns and filled the air with smoke. The fire is now 40 percent contained despite hot Santa Ana winds that have powered its expansion, at times sending embers far ahead of its main flank. Firefighters were employing more than 970 fire engines and 34 helicopters to battle the blaze.